In recent years, academic libraries have begun providing areas where students and faculty can load data, manipulate it, and display results in a rich, interactive setting. Institutions like Georgia State University http://library.gsu.edu/home/services-and-support/services/curve/ and NC State University https://www.lib.ncsu.edu/data/data-visualization have carved out these spaces and provided the necessary resources to support them. UCF Libraries has followed their progress and been interested in implementing similar services here. Faculty and students have kept us informed about their interest in and desire for having similar spaces at UCF. There are two types of display areas the Libraries is interested in, Video Walls and Visualization Walls. These are two distinct environments using similar hardware, different software, with different, but sometimes overlapping, functions. Video walls tend to be smaller and provide a venue for the display of academic projects, and as interactive space for trying out software products, or as an instructional area for demonstrating new technologies. Visualization walls take up a much larger area and provide a space where data can be “visualized” in some manner that illustrates concepts or displays associations in large, colorful, and interactive ways. UCF Libraries wants to implement a hybrid of the two models now for a very specific reason. Over the next several years, the John C. Hitt Library will be undergoing extensive renovations. Part of that renovation will include the construction of a large area that will support data visualization, video editing, and video display. As an interim solution, a hybrid model utilizing equipment that can be moved when construction begins will give us an opportunity to provide some services and “test the waters.” We believe this hybrid model will help us define the kind of larger space we’ll need to build during the renovation. With input from students and faculty, and further research into what other academic institutions have done, a space that fully serves the needs of UCF students and faculty will be realized through the use of this hybrid space. “The GIS cluster (made up of faculty from many disciplines, including engineering, anthropology, and sociology) is very supportive of a visualization space for the library. We think it will make an excellent general purpose space that could serve as the beginnings of a vision that could follow the trajectory of CURVE at Georgia State; it will be well used by students and a broad section of faculty. Additionally, the College of Sciences believes the proposed equipment would serve as a great space for showing and describing concepts and collections from a variety of other COS disciplines, including Biology (specimens and collections), Anthropology (archeological digs, skulls, and other artifacts), Chemistry (chemical models), and Physics (planetary science).” JP Peters, Director of IT, Facilities, and Marketing and Communications, College of Sciences. “The College of Arts and Humanities is very excited about the potential of the large visual display project proposed by the UCF Library. As data continues to grow in complexity and scope, large capacity, flexible visualization systems will continue to grow in importance for showing the interconnections between data and for developing spaces for showcasing cutting-edge work from the visual and performing arts. Faculty members in our college are particularly excited about the potential use of these monitors and the stitching technology for demonstrative creative works and projects from CAH including the STEAM exhibitions, the RICHES Mosaic digital history platform, student-developed video games within the School of Visual Arts and Design and FIEA, and many other potential projects.” Rudy McDaniel, Assistant Dean of Research and Technology, College of Arts and Humanities. To implement a hybrid Digital Studio, this technology fee proposal seeks funding for 3 – 70” TVs that can be used individually or have their images stitched together in either landscape or portrait mode. They will be located along the wall next to the current presentation practice room (Room 306). Access to UCF Apps (which include ArcGIS, SPSS, and SAS) and Tableau Reader will be available at each station. Next to them will be an editing bay where files can be worked on. In addition to UCF Apps, a desktop version of Tableau, Final Cut, and Creative Cloud will be available in the editing bay. Finally, the equipment in the presentation practice room will be updated to complete this digital production/visualization/presentation area. Access to each space will be by reservation, with LibTech staff on hand to activate the spaces and to check out any accessories needed for using the spaces. These accessories might include keyboards and mice (though the TVs will have a touchscreen overlay), headsets, microphones, and remotes. Each work area is a collaborative space with around 4-6 students able to fit in each area. The 5 areas include the 3 spaces with a TV, the editing bay, and the presentation practice room. The John C. Hitt Library is open 105 hours a week. The Libraries’ mission is to “provide information resources and services, facilities, and technology that support learning and teaching, research, creation of knowledge, intellectual growth, and enrichment of the academic experience.” UCF Libraries Mission Statement. Retrieved from http://library.ucf.edu/about/departments/administration/facts-figures/vision-mission-values/ . This proposal supports the expansion of technology offerings at UCF that are already being provided at other institutions. If we are to keep pace with the evolving technologies that are used in the work places we are preparing our students to enter, we need to makes this investment. The hardware and software sought will move our students from concepts to actualizing their work through the collaborative, interactive, visual spaces proposed. This project will be monitored closely as a proof of concept for a larger facility planned when the library building is renovated in the next several years. Input from students and faculty about the usefulness of the equipment, suggestions for enhancements and improvements, and statistics on use will be gathered and evaluated. The expectation is that this data will inform the design of a facility that will accommodate video wall displays, editing bays and visualization studios. Without a dedicated technology budget, the Libraries relies on technology fee funding to implement new innovations and replace aging equipment. Extended warranties are included in all purchases and obsolescence is anticipated. By staggering purchases, surveying staff and users regularly, and monitoring new technologies, Library IT supports and maintains current equipment, keeps current on the technology needs of users, and plans for future enhancements. 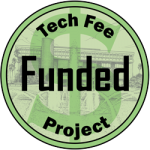 The list of equipment needed to complete the project was compiled through consultations with the UCF Technology Product Center (TPC) and contact with vendors with whom the TPC has a relationship. Conversations with Library faculty, students, the College of Sciences, and the College of Arts & Humanities helped to further define equipment and software needs. Quotes for equipment and software are included for most items. If an item does not have a corresponding quote, the TPC consistently has the item in stock. An FI was submitted to Facilities Planning & Construction and their quote and plan are included as well. The necessary electrical and data to connect the equipment, hardware and software are outlined in their plan which also includes paint and carpet. The 70” LED TVs include a 4 year extended warranty. Each will be mounted on a floor stand, have a 90 degree rotation adapter to move the display from landscape to portrait, and an accessory shelf. Each will also have a touch overlay that will turn it into a touchscreen TV. The video wall processing equipment includes the switching equipment, a rack to mount the equipment in with shelf and drawer, and associated connectors, adapters, and cables. The PC needed to run the TVs and switching equipment is a Dell OptiPlex 9020M, with an Intel Core i7 processor, 8GB memory, 128GB solid state drive with a 5 year warranty. The furniture for the editing bay is manufactured by Bretford and includes a table with a monitor arm, 2 outlets and 2 USB connections and 4 chairs. Software for the PCs will include free access to UCF Apps (ArcGIS, SPSS, SAS), Final Cut, and Creative Cloud. Tableau desktop will be loaded on the editing bay computer. The Tableau reader (which is free) will be available on the TV PCs. The equipment for the presentation practice room will provide an easy to use touch system designed to make recording presentations and streaming content as simple as possible. Note: The project was awarded funding for 2 TVs instead of 3 with a reduction in the attached PCs as well. Total awarded funding, $76,994.54.